#ZukesPack ambassador Natalia Martinez and her powderhound Willow; follow @thelabsand.co on Instagram for more adventures. We’re proud to team with the following adventure-driven, awe-inspiring dog lovers. They embody the Zuke’s “Live Life Off Leash” spirit every day as they explore and bound through nature with their four-legged companions by their side. Meet our #ZukesPack brand ambassadors below, follow them on Instagram, and join in on the fun. Let’s Go! Amber grew up surrounded by animals on a small farm in upstate New York, and her love for animals inspired her career as a licensed veterinary technician. She adopted Ariel more than 10 years ago, and together these best friends have hiked mountains all over New York State and became members of various mountain clubs, including the Adirondack 46ers, Catskill 3500ers, Saranac Lake 6ers, and the Tupper Lake Triad. When they’re not out hiking, Amber and Ariel can be found camping, kayaking, paddleboarding, and traveling throughout the U.S. and Canada. Ariel is also a member of Therapy Dogs International. Follow Amber and Ariel on Instagram at @ambpitch. 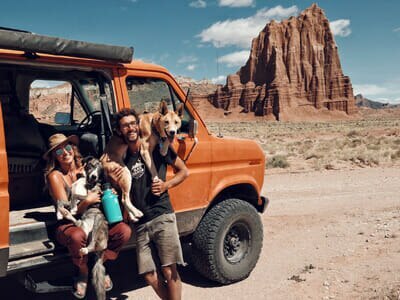 Brianna, Keith, and their dogs, Bucket and Dagwood, are desert dwellers who call their big orange van, Bertha, home. They believe that there isn’t much worth doing in life if you can’t bring your dog along. To date, Bucket and Dagwood have swam in the Atlantic and Pacific oceans, driven across the country three times, enjoyed beaches in Mexico, lived on a sailboat, climbed mountains from the Adirondacks to the Rockies, and rappelled through over 50 slot canyons. On any given day, the pack can be found mountain biking, kayaking, backcountry snowboarding, whitewater rafting, rock climbing, or canyoneering. Brianna and Keith are passionate about adoption, as both of their beloved dogs had rough beginnings in shelters. Follow their crew on Instagram at @briannamadia. Jen finds her energy playing outdoors. 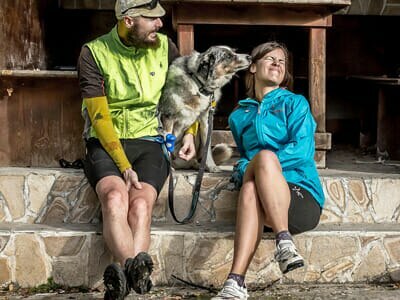 From 2015-2017, she traveled across Europe and South America by bicycle along with her partner, Dave and their dog Sora, a rescued Australian Shepherd. When she’s not cycling, you can find her running long distances in the woods or hiking in the mountains. She is always planning her next adventure. To read stories and see photos from her adventures, follow Jen at www.longhaultrekkers.com or @longhaultrekkers on Instagram. Katie is an independent, adventure-driven girl who likes to explore the trails with her mutts, Chipper and Quinci. They are her trusted sidekicks to adventure through every inch of Arizona where they live. She has a passion for the outdoors, wandering through beautiful nature, and discovering hidden gems along the way. Goofy bully blend, Chipper, and sassy, quirky rescue terrier, Quinci, take on the world together either on foot or SUP’ing. Follow them on Instagram at @trustyourtrail. Kerri was born and raised in Tuscon, Arizona, amongst saguaro cacti and extreme heat. She loves going on hiking, camping, mountain biking, paddle boarding, and backpacking adventures with her husband Jerad, her daughter Sydney, and her dogs, Goose and Dante. Goose is an Australian Shepherd with a tender heart that’s at home on the trails, and Dante is a German Shepherd who is a senior but doesn’t let that slow him down. 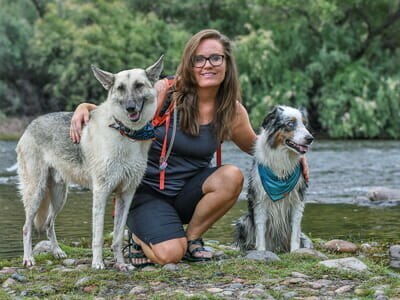 Kerri started her blog Dusty Desert Dogs a few years ago to document her adventures with her dogs, to review gear, and share photos. 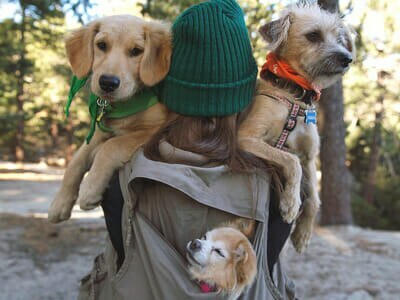 Adventure is contagious, and Kerri hopes to inspire others to get out and explore with their dogs. Follow them on Instagram at @dustydesertdogs and visit Kerri’s blog at www.dustydesertdogs.com. Nancy is a full-time techie, part-time photo hobbyist, and proud mom of three pups: Sammy, a small but mighty active senior; Pablo, an energetic, super happy terrier; and Marty, a Golden Retriever puppy and the newest addition to the crew. Their beloved adventure buddy Mac recently passed away, but his spirit lives on in every adventure they take.When the group of them are not playing in the mountains, they’re on the beach. And when they’re not on the beach, they’re probably on their way to the mountains. A Los Angeles native, Nancy has a strong itch for travel, adventure, and all things cheese. She enjoys simple living and exploring with her dogs. Her motto is: Camp, hike, travel, and repeat. Follow the gang on Instagram at @nancythebeat.